Sixty-three year old Mamao Keneseli has made significant contributions to community development on Nui atoll, one of nine districts in Tuvalu, for close to four decades. 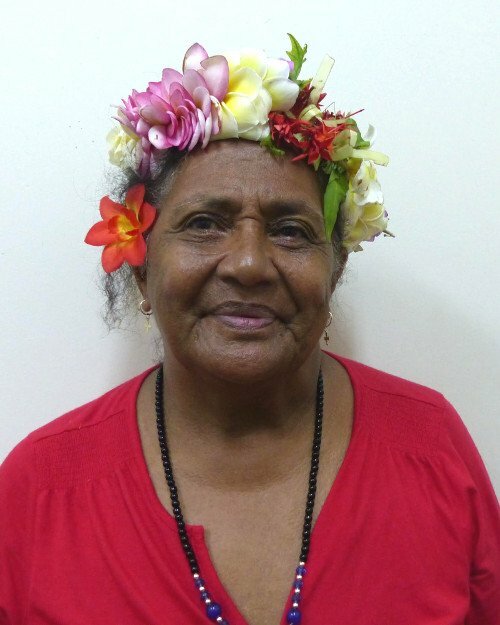 Her story is representative of a number of women community leaders in Tuvalu, now in their 60s, 70s and 80s, who have worked to improve the status of women and girls in Tuvalu despite facing numerous challenges. Ms Keneseli started her career as an early childhood teacher in 1981, where despite being paid AU$1 for two days of work a week, she still found ways to help her community. In 1990, she took on the challenge of running a women’s handicraft centre, where she mobilised atoll women to consistently produce traditional handicraft as a source of income. Some eleven years later in 2001, Ms Keneseli left the centre to take on a new challenge as the first woman to work in the community fish market among men for close to a decade. In 2010, she was appointed leader of the Matapulapula Women’s Group on Nui atoll, where she has supported women to improve their lives in a number of ways for a decade. Ms Keneseli stepped down from her position earlier this year but remains an active member of the group. This portrait of Mamao Keneseli was first published by the Pacific Community for the 70 Inspiring Women campaign, it is reproduced here (with some modifications of our own) with their permission.